Looking for a unique treat and amazing natural wonders? Come to Minoo City in Osaka to try tempura fried maple leaves and take a stroll along the Takido road! Minoo city in Osaka is popular place to live with great natural surroundings and a calm atmosphere. In autumn,many people come here to see the maple leaves. Do you know that there's a famous dish available here in fall? Have you heard what it's made of? More than ten shops serve maple leaf tempura on Takido street, which leads to Minoo waterfall, one of the most famous sightseeing spots in Minoo. Eating maple leaves... I wonder what they taste like? Hisakuni Kousendou, which opened over 75 years ago, is one of the shops famous for its maple leaf tempura, and they were kind enough to show us how it's made. Maple leaf tempura has a history dating back over 1300 years. The mountain in Minoo city was a known Shugendo area, a syncretic mountain religion in Japan. Shugendo practitioners were especially moved by the sight of beautiful maple leaves by the waterfall, and were inspired to create maple leaf tempura to serve to visitors to the area. This delicacy quickly became popular and ultimately grew to be one of the popular snacks and famous souvenirs of the region. This shop, Hisakuni Kousendou, grows their own 150 maple trees in order to produce their maple leaf tempura. They pickle the yellow leaves and store them every year; picking both purifies and preserves the maple leaves, which makes it possible for this shop to have maple leaf tempura available all year round. Maple leaf tempura isn't made from leaves that have fallen off the trees. Plus, they only use yellow maple leaves - leaves that have already turned red have thicker and harder stems, and may turn black when cooked, which isn't very appetizing. The pickled yellow leaves, coarse sugar, flour and sesame seeds are used to prepare the tempura batter. It takes a lot of time and work to make maple leaf tempura. Then it's time to deep fry them. They know the right oil temperature and cooking time to cook the perfect maple leaf tempura. Although they fry them fresh in the store all day long, they aren't sold when they're freshly cooked. Instead, maple leaf tempura is left overnight to remove as much oil as possible from it before being sold. If they're sold right after being fried, the heaviness and taste of the oil can overpower that of the tempura and maple leaf, and no one wants a mouthful of oil as a snack! What Does Maple Leaf Tempura Taste Like? It's quite crisp. The tempura batter has a slightly sweet taste while the veins of the leaf have a salty, pickled edge to them. They're very easy to eat, and taste amazing! Although called tempura, they have a taste that is somewhat similar to karinto, a deep fried brown sugar snack. Maple leaf tempura is served here at Hisakuni Kousendou and at other shops along with a nice cup of Japanese tea, which is the perfect accompaniment. Maple leaf tempura has many different variations depending on where you purchase it, which means that there are many different options to choose from in Minoo city. We recommend trying out some of the different types in order to find the one that best suits your palate. 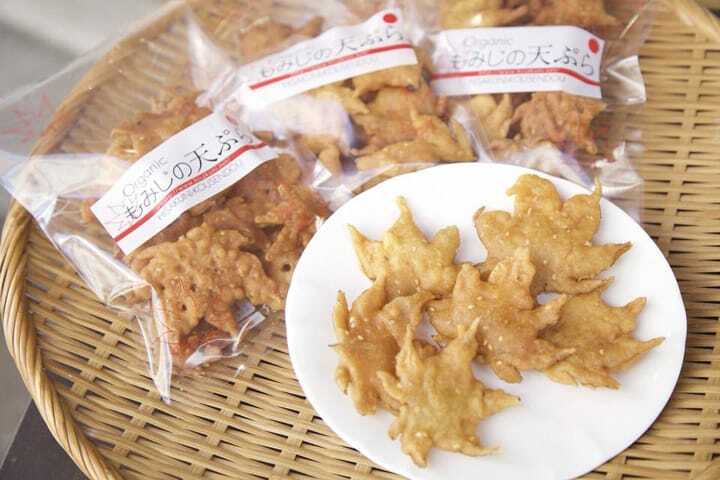 Maple leaf tempura can also be purchased in Osaka City Air Terminal (OCAT) in Osaka Minami, the shopping district in Namba, next to Minoo city. What do you think of maple leaf tempura? Are you tempted to give it a try? Maple leaf tempura can't readily be found in other parts of Japan, which makes it a must-try item if you're going to be visiting the Osaka area. They're an especially fun treat to enjoy as you stroll about Takido street and visit the waterfall here too. This area is also popular with those hiking and trekking in the woods, and as more and more visitors from around the world are coming here, the wife of the owner of Hisakuni Kousendou has prepared maps in English, Chinese, Korean and Thai to help sightseers get the most out of their visit to Minoo. By all means, please visit Minoo in Osaka and see their natural wonders as you enjoy some delicious maple leaf tempura!